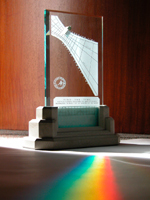 The Spectra Sundial Gallery - a showcase of custom vertical rainbow sundials and the rainbow colors they create around the world. 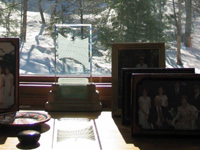 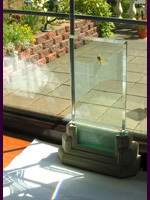 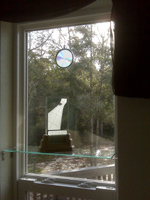 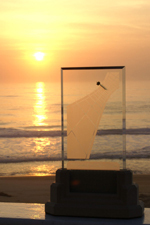 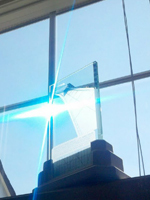 Welcome to the Spectra sundial gallery, where we post some of the sundial pictures that have been sent to us by their proud owners. 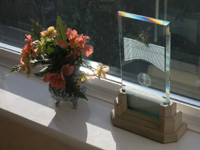 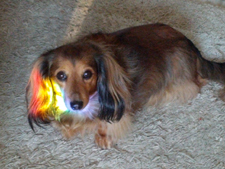 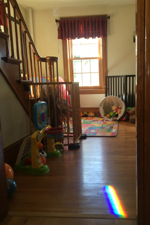 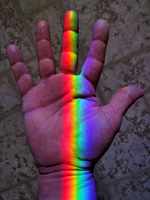 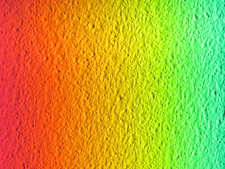 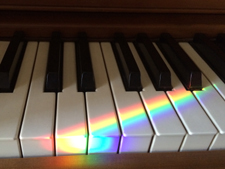 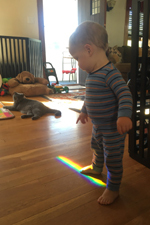 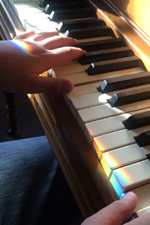 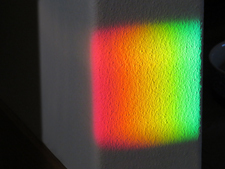 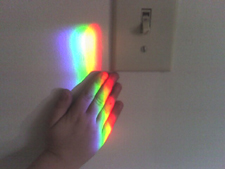 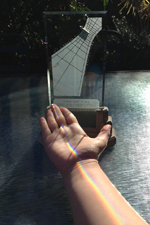 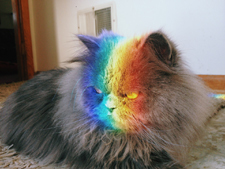 We think it is interesting to see these custom rainbow sundials in context in the home, and we are pleased to present these Spectra sundials and pictures of their colorful effects on our site for our visitors to see and enjoy. 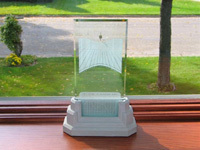 Every Spectra sundial is custom made for its specific location and as a result, all of these unique vertical sundials look a little bit different - no two Spectra sundials are ever exactly the same - yet they are all part of the same worldwide family of Spectra sundials. 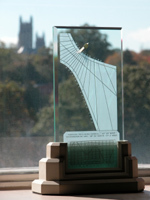 This sundial photo gallery shows the changing nature of the layout of a vertical sundial as it is adapted to tell accurate time based on the direction it faces and the specific geographic location for which it was designed. 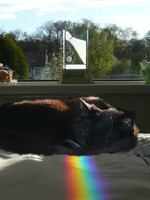 Click on the sundial pictures below to learn more about each sundial, where it is in the world, which direction it was designed to face, or the story behind some of the rainbow pictures we have received from Spectra owners over the years...and on some of the pages, you can click the picture to get an even bigger version of the photo! 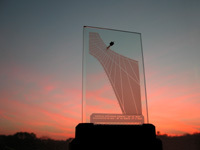 We hope that these sundial pictures will serve as an educational and visual sundial resource, and perhaps inspire you to make your own vertical sundial - or maybe even have us make a sundial just for you or send you a special sundial gift certificate that you can give to a friend. 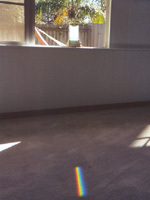 With its ever changing shadows and vivid light show, it can be quite challenging to capture the true essence of a Spectra sundial in a photograph. 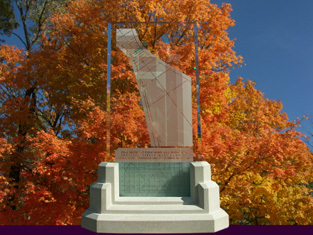 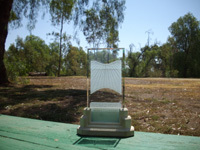 If you have one of Jim Tallman's Spectra sundials and would like to see a picture of it here, send it to us and we will post it for all the world to see. 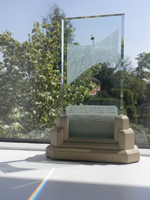 We always protect the privacy of our clients, so we will only post their Spectra sundial pictures here if they give us permission to do so. 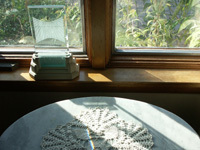 The Spectra sundial is an original copyright-protected product from the studios of Artisan Industrials Corporation. 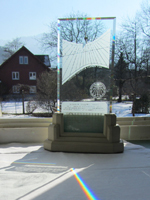 Dealer and gallery inquiries are welcome - contact us directly if you are interested in working with us on any special projects or representing our exclusive sundials.